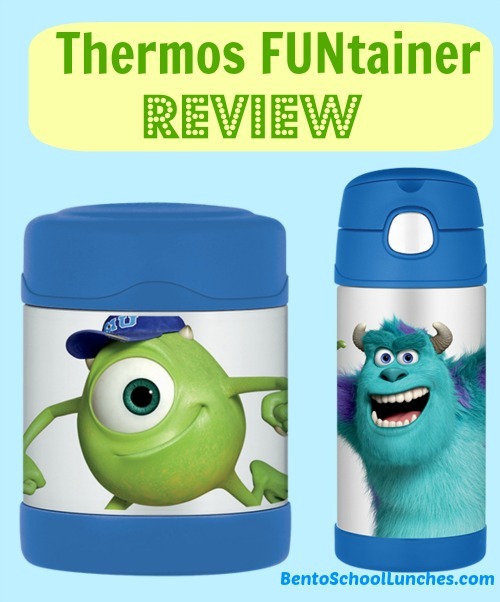 I was given the opportunity to review one of our favorite products, Thermos FUNtainer. As always, I asked Nikolai to choose his favorite bottle and food jar and he chose the Monsters University set. We received them the same day the movie was released in cinemas, how cool is that! We went to the movie last weekend and Nikolai was very happy to have the drink bottle with him. We have always carried a drink container for him when ever we were away from home, and I have found that the Thermos bottles seal well enough that I have no worries even dropping one in my handbag to make sure it doesn't get left behind. We use the food jar to pack a wide variety of foods such as chili, soups, mac and cheese and other pasta favorites, or sometimes tasty left-overs. I usually preheat or cool the container by filling it with hot or cold water and let it stand in there (around five minutes) while I prepare the food, then empty the water and fill with the food. Both the bottle and the food jar have double wall vacuum insulation for maximum cold temperature retention and they are dishwasher safe. The bottle will keep your drink cold for 12 hours, comes with a hygienic push button lid and a pop-up silicone straw that is easy to open and use. The exterior stays condensation free, non slip, scratch resistant base and has a flip-up carry loop. The food jar will your food cold for 7 hours or hot for 5 hours, which is long enough to keep Nikolai's food just right until lunch time comes at school. Both the bottle and food jar are made with an unbreakable stainless steel interior and exterior that will withstand the daily wear and tear. There are so many varieties of the FUNtainer bottles and food jars that can be found at Thermos site. As you all might know, it is school holidays here, Nikolai follows me to work and at times I will pack him a bento lunch or snack depending on our daily schedule. 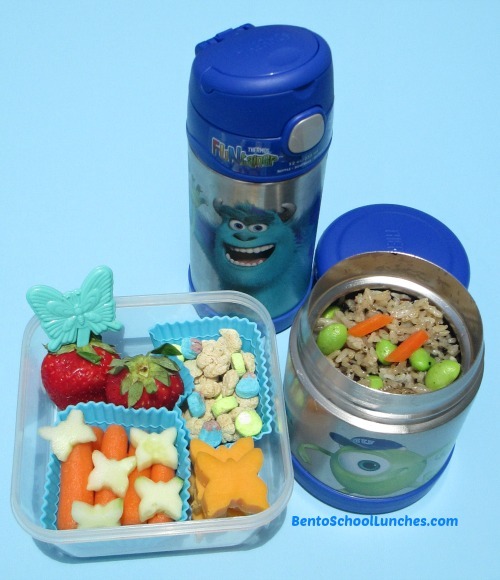 Here is a simple but yummy lunch packed in his Thermos FUNtainer food jar. Leftover Japanese style fried rice with tofu, edamame, seaweed and carrot sticks packed in Thermos FUNtainer food jar. V8 V-Fusion juice in Thermos FUNtainer bottle. Side of strawberries, baby carrots, butterfly shaped cucumber pieces, butterfly shaped cheddar cheese and limited edition Kellogg's Monsters University cereal. Disclosure: Thermos generously provided me with the items for review without cost to me. Other than receiving the products, I have not received any compensation to write this review. Such lovely containers!! My boys would love these! N ur fried rice looks delish, so hungry now. Aww...nice containers with yummy foods too! I saw Hello Kitty from the linked!